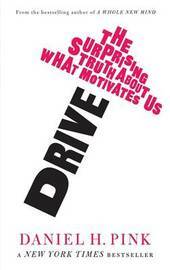 We've been conditioned to think that the best way to motivate ourselves and others is through external rewards like money or fame, or by the fear of punishment - the carrot-and-stick approach. That's a mistake, Daniel H. Pink says in his transformative new book. The key to high performance and satisfaction is intrinsic, internal motivation: the desire to follow your own interests and understand the benefits in them for you. In Drive, Pink lays out the hard science for these surprising insights; describes how people and corporations can embrace them; offers details about how we can master them; and provides concrete examples of how intrinsic motivation works on the job, at home and in ourselves. Daniel H. Pink is the author of a trio of provocative, bestselling books on the changing world of work, including A Whole New Mind: Why Right-Brainers Will Rule the Future, a long-running New York Times and Business Week bestseller that has been translated into 18 languages. A free agent himself, Dan held his last real job in the White House, where he served from 1995 to 1997 as chief speechwriter to Vice President Al Gore.